The normally sleepy town of Semporna, situated on the eastern coast of Sabah becomes the cynosure of all eyes during the month of April, when it holds an elaborate celebration of the annual Malaysia Water Festival. Semporna which is often used as a pit-stop by tourists en route to the scuba-diving paradise, Sipadan, is home to the Bajau people, enthusiastic seafarers who are also known to be able craftsman. The Bajau use a single-masted, sail-boat known as a Lepa to traverse the seas. These Bajau Lepas are fashioned out of locally sourced red seraya wood and elaborately decorated with intricate wood carvings, colorful sails and many tapis or flags. In Semporna, the celebration of the Malaysia Water Festival, takes the form of the Regatta Lepa, a boat race that pays homage to the lepa. The a tradition of hosting a regatta for the celebration of the annual Malaysia Water Festival, originated in the 1990s and now the event serves as a popular draw for domestic and international tourists. The Regatta Lepa in Semporna will be held from April 26th to 28th, in 2013. The regatta is usually the main draw of the festival but the town also hosts a festival bazaar that is generally set up a few days before the event. This bazaar features vendors of various local arts and crafts along with vendors of various delectable Malaysian eats. The bazaar attracts throngs of visitors from neighboring towns and villages. The first day of the festival usually features various Bajua cultural performances which are then followed by a plethora of competitive events on the second day. These competition events usually include kayak and boat races, telematches, lepa-tug-war contests, swimming races and even a rather unique duck-catching quest. 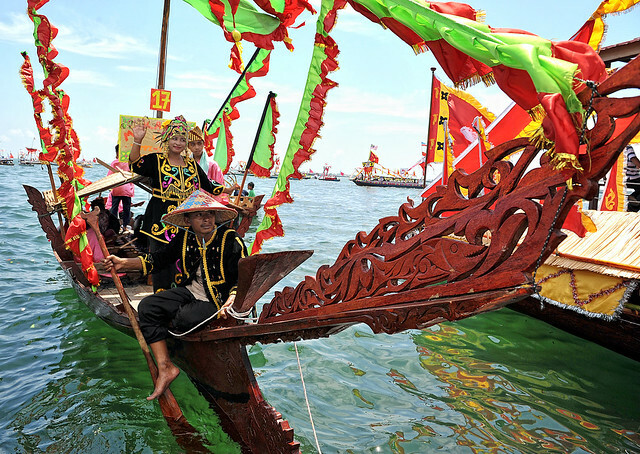 The last day of the festival usually features the grand Regatta which showcases beautifully adorned lepas that take a turn of the bay as they are cheered on by raucous crowds. Onboard these lepas are local dance and music troupes that consist of musicians and elaborately costumed female dancers who move gracefully to the sounds of the gongs and drums. As the lepas traverse the bay, they are judged on their appearance and prizes are handed out for the best in show. At the end of the Regatta, a huge party atmosphere prevails over Semporna as the locals and visitors indulge in much dancing, feasting and other forms of revelry. A colorful fireworks display usually wraps up the event. The Regatta Lepa offers visitors the unique opportunity to experience and participate in an authentic Malaysian celebration in one of the most picturesque corners of the country.